Yevgeny Privin and Sergei Mikhalchuk awarded Silver Bear at 65th edition of Berlin festival for outstanding contribution to motion picture art. 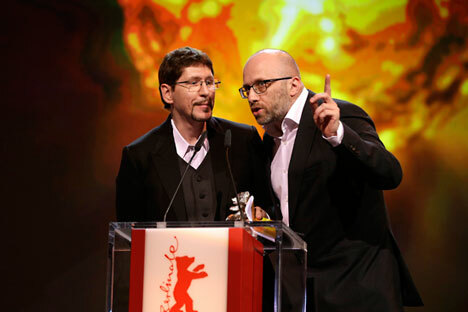 Russian cameramen Yevgeny Privin and Sergei Mikhalchuk have been recognized for their work on Russian director Alexei German Jr.’s film Under Electric Clouds by being awarded a Silver Bear for “outstanding contribution to motion picture art” at the 65th Berlin Film Festival on Feb. 14. "I watched the movie in Berlin, and I can tell that it has several undisputed merits,” culturologist and editor-in-chief of the Iskusstvo Kino (“Art of Cinema”) magazine Daniil Dondurei told RBTH. “It unites New Wave stylistics, Antonioni and Visconti's well-known movies of the 1970s and modern neo-realist vision. The visuals in this film speak in a different language and it has a separate context in relation to the screenplay. "Once, about 30 years ago, when I came to cinema from the world of art critics, our well-known director Sergei Solovyov explained to me that everything in a movie, from the frames to the text and intonation, is created by only one person – its director. Therefore this prize belongs equally to Alexei German,” said Dondurei. Under Electric Clouds consists of seven novellas, formally united by a single location. A son and daughter live in a huge unfinished house. Its owner, their father, has died, and they must decide what to do: to sell or complete the building. The movie is a collaboration by Russia, Poland and Ukraine. Shooting began in 2012 in Kharkov and Odessa (Ukraine), and ended in March 2014 in St. Petersburg. The world premiere took place on Feb. 10 in Berlin.